Home » Posts Tagged "national forest"
I saw the blur out of my side window but didn’t have enough time to react as the little doe came busting out of the brush. I was doing about 60mph in my Silverado. The doe left a perfect indent in my grille, instantly breaking her neck as she careened into the ditch. The noise woke up my son, Brett, who was taking his customary “nothing to shoot, Dad, and your old hunting stories are boring” mid-day nap. 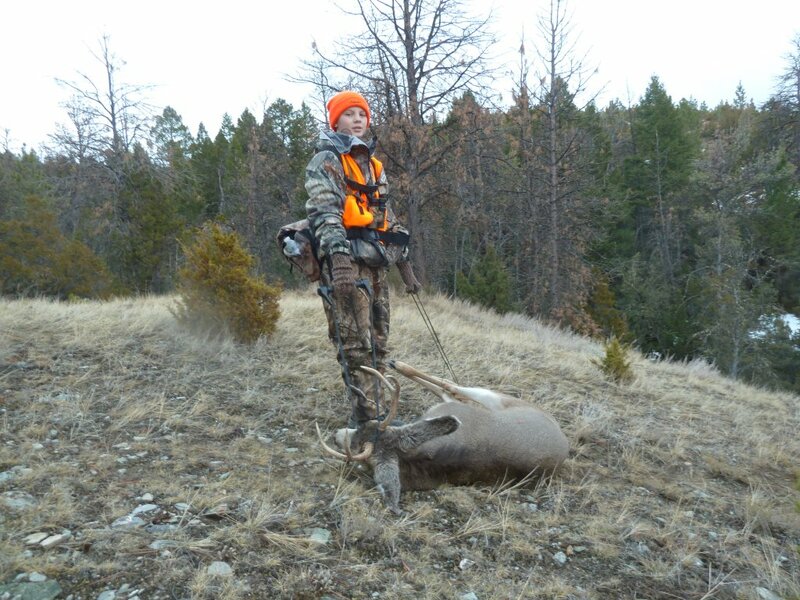 It was Wednesday, the final day of my son’s first Montana hunting trip and things were not going as planned. But despite being told that a herd of elk we were following a couple of days earlier smelled like my cologne, and notwithstanding the 20-minute episode where he refused to move from a mountainside and walk a 1/3 mile back to the truck because he was tired, and not counting the flat tire we had to deal with, hunting with my son was awesome. 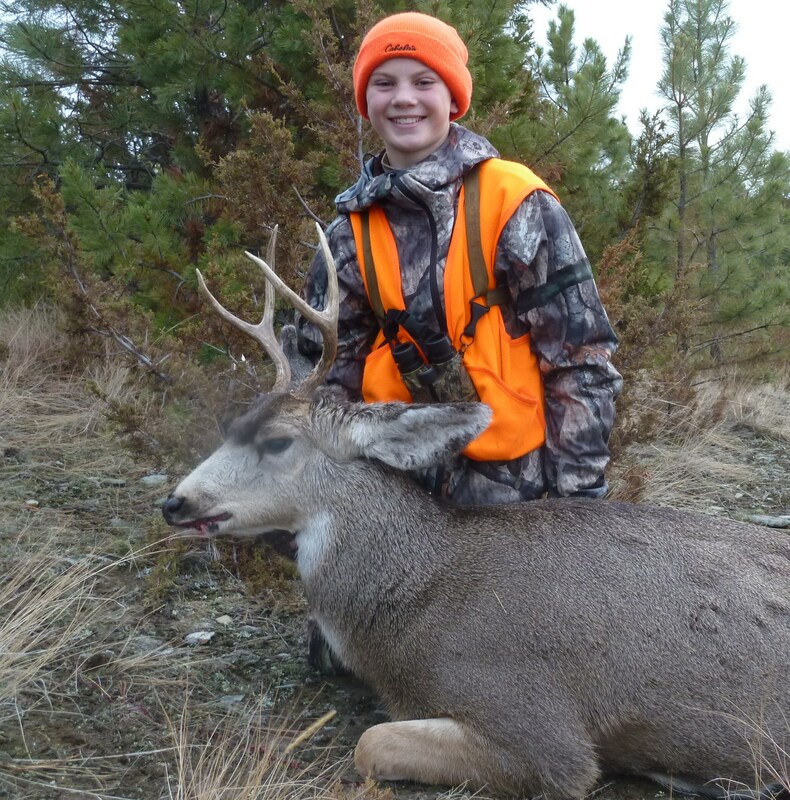 We had seen lots of animals, and Brett had opportunities at both a mule deer and a whitetail, as well as a young cow elk, but the 12-year old had yet to draw blood. Brett standing tall in the hills of Montana. We were on our way to an area of the lower ranch we were hunting known as the “buck hole” when the little whitetail had the unfortunate encounter with my Chevy. After taking pictures of my truck and the deer for my insurance agent, we headed up the backside of an area we had seen bucks in the previous evening. We quickly threw on our packs and headed up a ridge towards the flat top of the mountain. As soon as we got there, Brett spotted several deer walking in a clearing between two small pine thickets. Two of the deer appeared to be chasing each other. I put up the glasses to get a better look. Both of them were bucks! One was a spike with tall tines and the other was a two-point with one horn broke off. They were not paying attention to us and they were only about 150 yards away. I told Brett to shoot the spike as soon as it stopped. I reached in my pack to get out the shooting sticks only to remember that I left them in the truck! I tried to get Brett to get on one knee or shoot lying down with my pack as a rest, but he wanted to stand up. Needless to say, he emptied his gun at that deer. Nary a hair was touched. It was yet another disappointment for Brett, looking to score on his first deer ever. We followed the small heard for a while, but could never get another opportunity. At this point we were both cold and hungry and a little dejected. We decided to go grab a hamburger, wash the mud off the truck, call mom, and head for home. After downing our cheeseburger and fries, we walked out of the tavern (well, it IS Montana) to see a truck pull up with lots of legs and horns sticking out. Four guys in camo hopped out and headed in to celebrate. In the back was a dandy six point bull. “We’ll come back next year,” I said as we hopped in the truck to drive the short distance to the car wash. I then proceeded to dump in $5 worth of quarters to get four days worth of Montana mud off of my truck. “All right, one more hunt, let’s go,” he said. We hung up the phone and headed back into the hills. We parked at the bottom of the same hill we were at two nights earlier. It was 4 o’clock by the time we worked our way to the top. We spent about 10 minutes glassing the distant hillside and brush patches, but didn’t spot an animal. We decided to move about a quarter mile along the top, where we could now see the other side of a hillside that was running perpendicular to us. Below was a draw leading to more small hills that were interspersed with pines, junipers and clumps of dry grass. I knew the deer had to be somewhere in the area, I was just hoping we could find them soon; we were running out of daylight. After a few minutes of sitting and glassing, I spotted a suspicious white patch in the middle of one of the small hills. 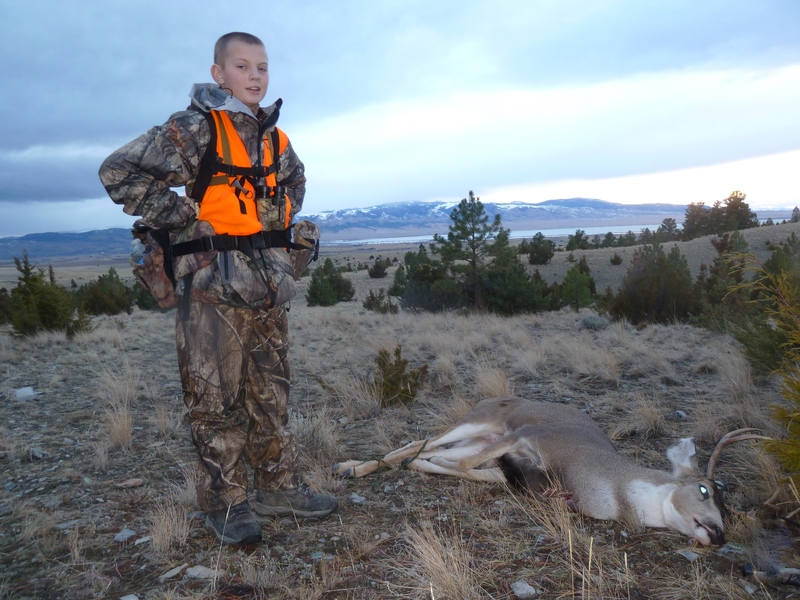 It was a small muley doe. I pointed her out to Brett and told him she wouldn’t be alone, and that hopefully she would have a boyfriend close by. We soon spotted four others; does and yearlings as well. Brett then focused his attention on the small hill to the right. 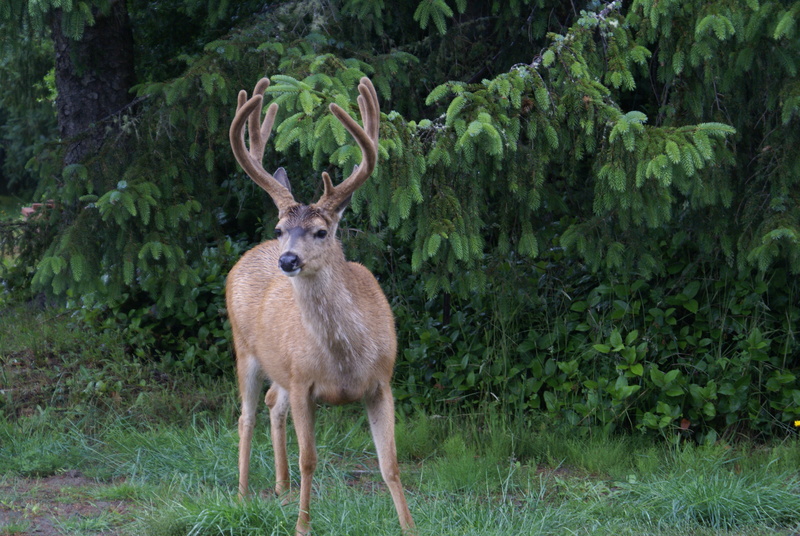 “I think I see a buck dad, and he’s looking right at us,” he said quietly. He put down his binoculars and showed me where he was looking. Sure enough, 200 yards below stood a young 2-point directly facing us. I already had the shooting sticks out, and I placed them in front of Brett. I asked him if he had his scoped turned to 6-power and he nodded yes. “Are you seriously going to make me drag this by myself? “Wait till he turns broadside,” I whispered. On cue, the deer turned broadside and begin to walk towards the other deer. As soon as he stopped, Brett‘s .280 shattered the silence across the hillside, missing its intended target. The deer, sensing something wasn’t right, took a couple of quick hops up the hill. Brett didn’t wait until he stopped before his second shot also missed its mark. The deer then disappeared at the base of the hill behind a tree, before reappearing again on the adjacent hill. He then stopped, quartering away from us, facing up hill. I told Brett to take a deep breath and slowly let it out while at the same time squeezing the trigger. As his Ruger barked for the third time, a funny thing happened: the deer dropped in his tracks. Brett turned to me with a smile. “I think I smoked him that time. “ We unloaded his remaining shell, walked down the hill and up the other side. We found him laying dead under a tree, shot through the spine. 5 MORE Big Challenges with Bowhunting, and how to overcome them. 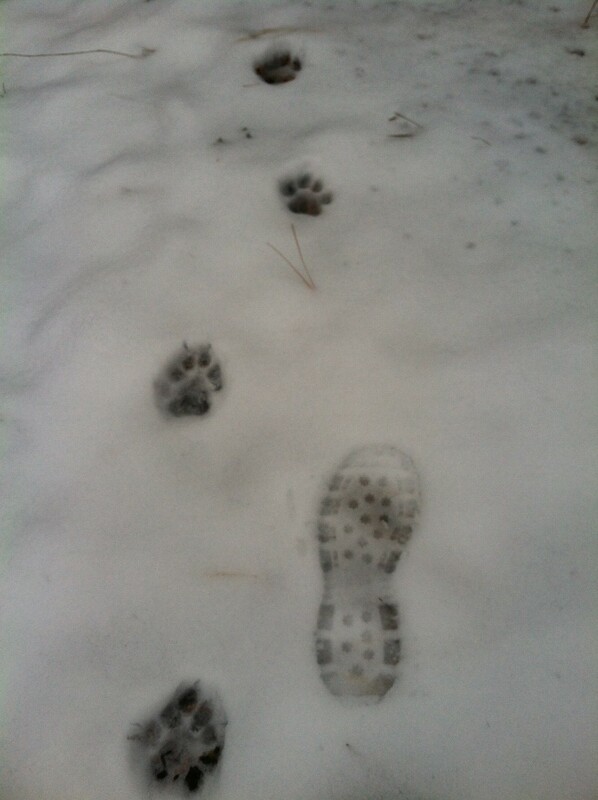 Cougar tracks. 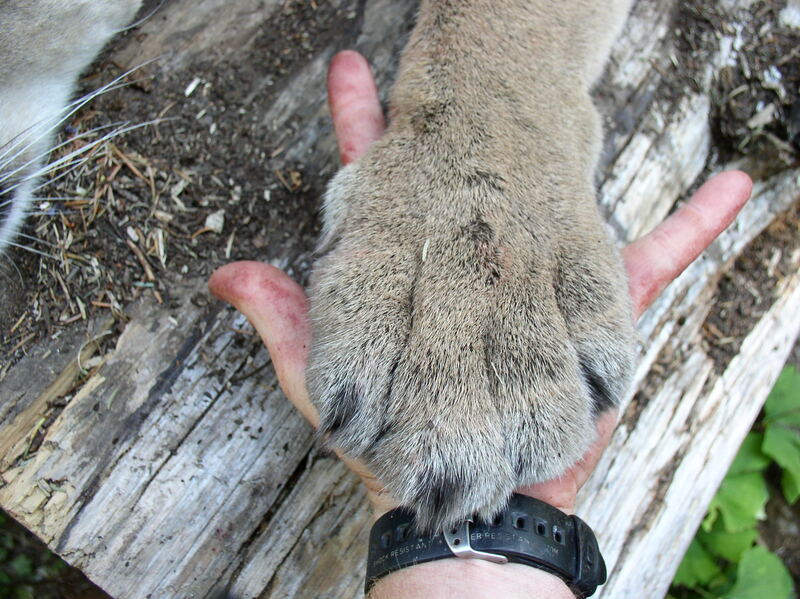 I wasn’t far behind this cat in Eastern Washington. 6. Scouting. When you only have to get to within 200 or 300 yards of an animal, your scouting can be substantially more lackadaisical. When you need to be within 20 or 30 yards, your scouting has to be as pinpointed as the shot itself. You can’t just find an “area with sign,” you have to find exactly where your game will be and when they will be there. Hunting in the National Forest is a different beast altogether, as it took me several years to pinpoint where the wily whitetail buck was going to show up. This year it paid off with a 140’s class brute. Although I have yet to employ them, game cameras are justifiably all the rage for obvious reasons. 5 Big Challenges of Bowhunting…and how to overcome them. When I entered the world of bowhunting as a 40 year-old, I thought it was going to be easier than it was. I admit, part of my challenge is where I hunt, how I hunt, and for what I hunt. Although I have a decent resume of animals I have taken with a bow, none have been from a treestand, none have been on guided hunts, and none have been on private property. Don’t get me wrong, I have absolutely nothing against guided hunts or taking animals from trees; I am all for it and I want to do it! But the fact is, I was simply not afforded the opportunity. So I had to learn by trial and error as I taught myself the ins and outs of bowhunting public forests and mountains. Let it be clear, I am still learning every time I enter the woods. Here are 5 big challenges of hunting with a bow, in no particular order.